You can go on instagram, pinterest, you tube and many other places and you will find ideas for prep cooking. Prep cooking is a derivative of Big/Bulk cooking or Once a Month Cooking.. Prep cooking is a scaled down Big/Bulk cooking with less variety. Basically you cook a lot of the same food for five meals, often times all the same exact meal. That’s okay for some, but I just do not want to eat the same thing for 5 days straight. Do you? I prefer Big cooking because it lets me put a variety of meals in my freezer for future meals for the week or later for another time. When my boys were at home I did Big cooking often. It was easier to spend a couple of hours putting together meals for the rest of the week. In my catering and as a personal chef Big cooking is the normal. You learn to get the most use out of your ingredients. I have done big cooking with many proteins: pork, beef and chicken. Previously I posted a number of different meals just by cooking two pork tenderloins. From that big/bulk cooking I made quesadillas, soup, sandwiches, and of course the main meal. I believe I was able to get five different types of meals from one big cooking round. I thought I would show you how to transform one sheet pan of chicken breasts and one sheet pan of roasted veggies into multiple meals with different flavors. Preheat oven to 350 degrees. Line two sheet pans with aluminum foil. Pat chicken breasts dry with paper towel. Place chicken breasts on one of the sheet pans. 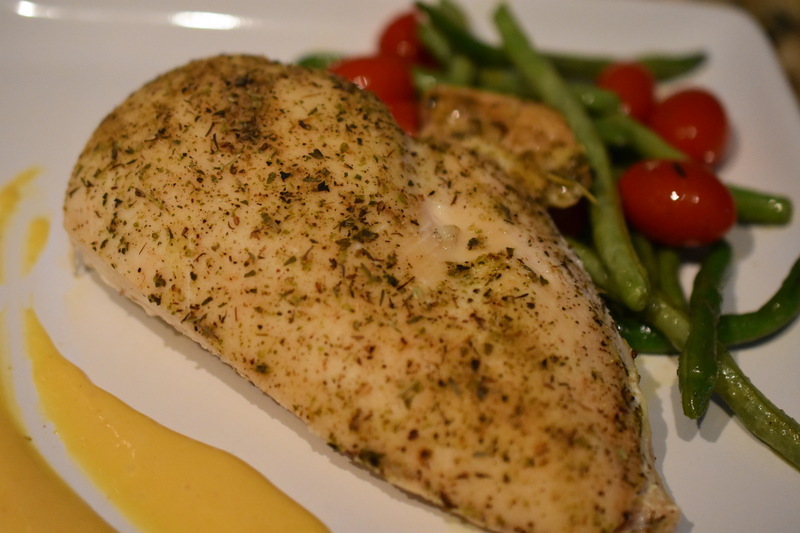 Drizzle chicken breasts with olive oil. Make sure the chicken is well coated. Generously sprinkle all-purpose seasoning on chicken. Spread green beans and cherry tomatoes on second aluminum lined sheet pan. Like the chicken, drizzle olive oil onto the veggies. Sprinkle all- purpose seasoning on veggies. Stir. The next step is a bit staggered. Cook the chicken breasts first for 20 minutes. After 20 minutes add the veggies to the oven to roast for 20 minutes. (Roast chicken for 40 minutes and veggies for 20 minutes). Chicken should be cooked to 160 degrees. Meal one is ready. Serve. Eat. Enjoy. Thank you. I really think these are worth trying.